Nums: Which professions contribute the most (and least) to society? Military and teachers contribute the most to society … with doctors, scientists & engineers in the hunt. Lawyers and business execs contribute the least … with less than 1 in 5 people perceiving that lawyers contribute to society’s well-being. All professions surveyed –- except business executives — declined in perceived social contribution from 2009 to 2013. Hypothesis: Business execs get some credit for the improvement in the economy from 2009 lows. Note that journalists dropped the most … down 10 points from 2009 … and now challenging business execs for one of the two bottom slots. Only 37% think that clergy contribute to society’s well-being. 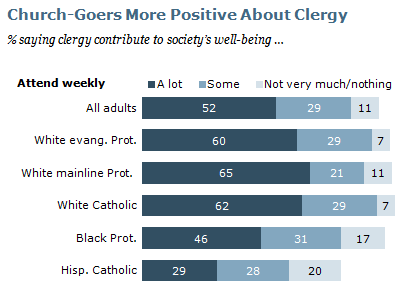 Pew headlines the finding as “Church-goers more positive on clergy”. Not surprisingly, that’s true … but it’s not the story. Only about half of church-goers think clergy contribute to social well-being. The number is 2 out of 3 for most groups … dragged down by low scores from Hispanic Catholics … often reported to be among the most religious. My question: in the 2 out of 3 groups, why are the other 1 in 3 going to go to church if they don’t think the clergy are contribution to social value? My hypothesis: they fear hell if they don’t show up on Sunday … nothing like a little Catholic guilt. This entry was posted on July 12, 2013 at 7:45 am and is filed under Careers & Interviewing, Social Responsibilty. You can follow any responses to this entry through the RSS 2.0 feed. You can leave a response, or trackback from your own site.